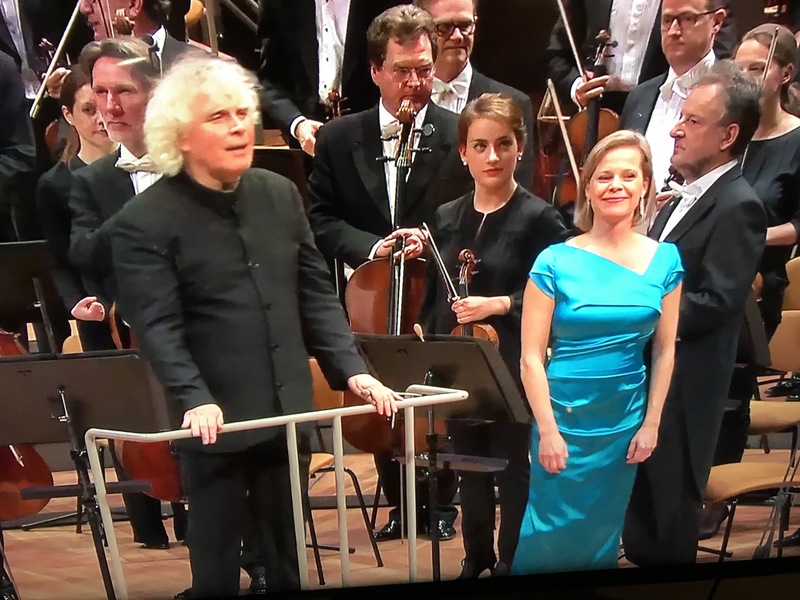 Spellbinding Mahler 4 from Berlin this evening, with expressive and searching singing from Camilla Tilling. This is Rattle’s last season with the BPO before moving to London, the Barbican and the LSO in September 2017. The Berlin Philharmonic Orchestra Digital Concert Hall is superb, and available on all devices and most TVs. Whilst a £12 per month subscription may seem expensive it does give you access to an archive of 100s of concerts, stretching back to Karajan days. There are live broadcasts of each concert in the BPO season and they really do make you feel you are there. Occasionally there are interval talks and eventually the concert is added to the archive. Indeed, I shall have to wait for this particular concert to be added as I had to miss the Ligeti Violin Concerto in the first half – an outstanding and unusual work featuring a chorus of ocarinas at one point! The sound quality is superb (best fed through your hifi or home cinema system) and if you look very closely you can see the fixed cameras at strategic points around the platform. These are remotely controlled and switched as in any event broadcast, and the cueing is generally spot-on. In this Mahler concert the balance of the woodwinds and solo horn in the Scherzo was beautiful and the huge tutti at the end of the Adagio truly powerful. Rattle’s expressions as the controlled the balance were fascinating to watch, and the individual members of the orchestra are now becoming familiar faces. On a final note, in the App version (IOS and Android) you can download archive concerts so you can watch them whilst travelling and not need any form of internet connection. Posted in music, performance.Tagged Berlin Philharmonic, Camilla Tilling, Mahler, Simon Rattle.